An all-electric bus, BYD K12A, that can run at a speed of 70 kilometers per hour when full-loaded with 250 passengers, was launched Monday, marking another breakthrough since the unveiling of an electric double-decker bus in London, the Shenzhen Economic Daily reported. The electric bus is claimed to be the world’s longest pure electric bus yet. Apart from being equipped with core technologies, such as a BYD-developed electric battery, electric motor and electric controls, the bus adopts a 4WD system that can “switch between 2WD and 4WD to satisfy the demands of different terrains while also reducing the vehicle’s overall energy consumption,” according to the Daily report. It was also designed with an all-aluminum body to reduce weight. The former mayor of London, Boris Johnson, said three years ago that he didn’t believe someone could manufacture an electric double-decker bus at the time, because such a bus would demand the top technologies, including one to balance the body’s weight and mileage. 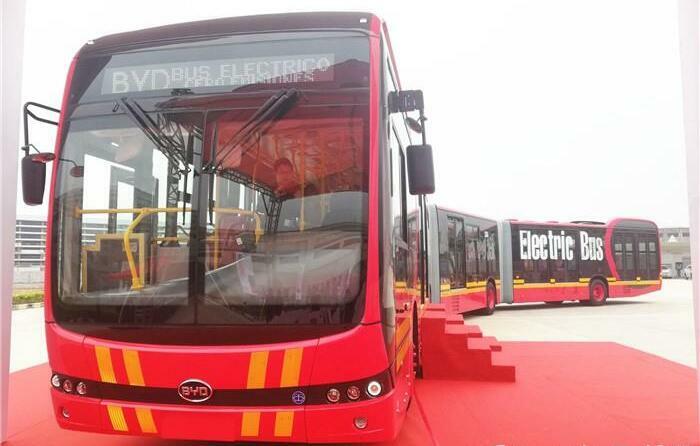 However, BYD successfully broke the bottleneck in a few months to produce the world’s first electric double-decker bus. This time, BYD once again tackled all of the technical challenges in creating a long electric bus, such as the vehicle’s turning and climbing issues, the report said. Each BYD K12A bus can lower CO2 emissions by 80 tons per year, meaning that 36,000 liters of fuel will be saved during the car’s lifetime. So far, BYD has manufactured more than 50,000 pure electric buses in over 300 cities around the world, according to the report.